﻿ There are some people in this world that are just good. It might not be their fault really. Maybe they're just born that way. Maybe scientiats should explore recessive genes more or maybe all the credit should go to the parents - perhaps Jim Henson & Seasme Street. Hard to say really - the Nuture vs. Nature debate has lasted for centuries really. But none the less there are those good people out there that are really special and should get to wear a special hat or something so we can spot them in crowded malls and farmers markets and be inspired to be good people too. If I was in charge of handing out the Good People Hats - one of the first ones would go to Marisa Miller Wolfson. Yes - she's a hot blond with a big brain but she also has a huge heart and ton of talent. Some of you may have heard of her work on the soon to released documantary Vegucated. A brilliant film that follows three meat & cheese loving New Yorkers adopting a vegan diet for six weeks and learn what it’s all about. I mostly know her from Kind Green Planet - one of my very favorite websites! Recently I freaked out (in a great way) when I saw Marisa had blogged about Our Little Betty Crocker Project as one of her weekly missions and made the infamously delicoius Rustic Avocado Sandwich. We're both so happy she is contributng to our Family Album today and hopefully I won't spoil too much when I say - She has found a way to make baking cookies exciting and I'm pretty jealous of her Cookie Party and her large cookie cutters! OK no more gushing about our Guest Blogger - Here's Marisa! I love cookies. At any given moment, I can turn to my husband and ask, "What am I thinking about?" and his answer will be "cupcakes or cookies." He will be right. So you can imagine how excited I get by the holiday vegan cookie swap that our friends Michael and Annie Walsh have every year. Everybody bakes a few batches of one kind of cookie and leaves with an assortment of dozens of different kinds of cookies. It is a cookie monster's dream. So how perfect was it when Annie asked me to try out one of her recipes, and she just HAPPENED to have posted one for gingerbread cookies. She tried them out herself and found that while they were tasty and soft, she used cookie cutters that were too small to have much fun with decorating. I ran to my baking drawer and found cookie cutters of all sizes. We had a winner! In my Vegan at Heart email coaching program, I'm always preaching the gospel of planning meals ahead of time to avoid stress and fear of scarcity. I also remind people to read the entire recipe before you decide to make something, before you buy ingredients, and certainly before you start cooking or baking. Do as I say, people, not as I do. In true Marisa fashion (I put the "buh?" in blonde), I skimmed the recipe and forgot to notice a 2-hour-or-more dough chill time and a 1-hour cookie-cooking time. It was after 11 a.m. The party started at 3, and I hadn't even bought my ingredients yet. Aaack! The race was on. I got all my ingredients together, set them out on the counter, and noticed that the recipe said "cloves." I had cloves: whole cloves! Not ground ones. Ruh-roh. So I whipped out (or rather lugged out) my heavy mortar and pistle and ground, ground, ground away at the cloves until I had something resembling a powder. I fancied myself an apprentice at an apothecary, using my vast knowledge of herbology to cure the masses of their afflictions. I was tempted to put the powder into an envelope and send it to a Shakespearean character with a note. But not knowing any Shakespearean characters personally, I put my potent herbs and daydreamings aside, whipped out my non-Elizabethan hand mixer, and mixed the brown sugar, shortening, water, and ample amounts of molasses in a great big bowl until completely blended. Then I added the rest of the ingredients, covered it with foil and put it in the fridge for 2 hours. I turned my attention to the White Frosting, which meant mixing 3 cups of powdered sugar, 1/3 cup margarine (I used Earth Balance), 1.5 tsp vanilla and 2 Tbsp soy milk (I used rice milk) with my hand mixer until smooth and creamy. Then I pre-heated the oven to 350 degrees and got dressed for the party and added ice packs all around the dough in the fridge to speed up the cooling process. As soon as the dough hit the 2-hour mark, I whipped it out, floured my big wooden cookie board and rolling pin, and went to town on that dough until it was about 1/4" thick. 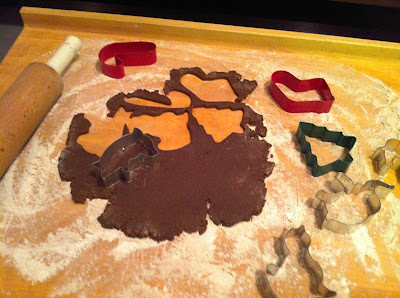 I chose my choicest cookie cutters and started cutting away. This dough was dreamy and PERFECT for cookie cutters. I could even do characters with legs without fear of the leg sticking to the cutter and getting mutilated. I put them in the oven for 10 minutes, took them out and cooled them on racks. I did several batches before I realized that I didn't need an hour for them to cool. They only took about 20 minutes each. Yesss! Then I put them on the cookie board and spooned my icing into my clear barrel cookie press. I put the small, round decorating tip on it, and pulled the trigger to make the icing start to come out in spaghetti-sized strings of icing. 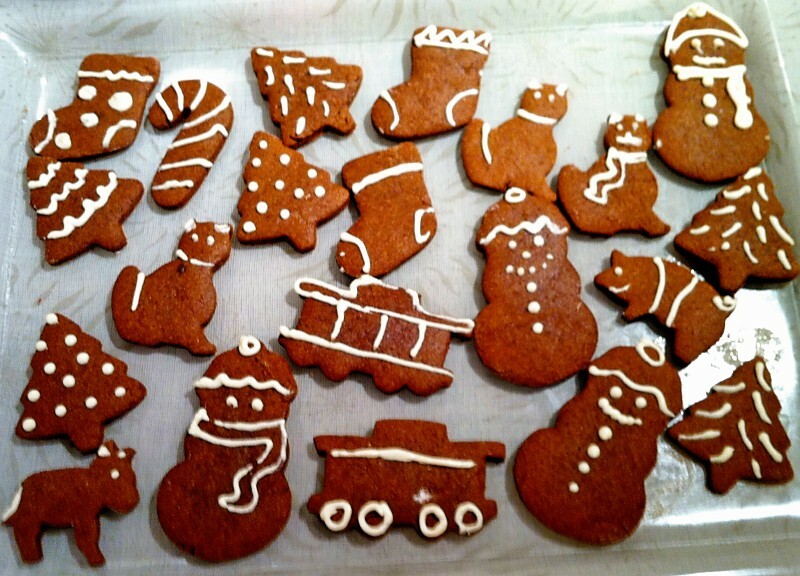 I had A LOT of fun decorating the cookies, which I realized included no human shapes. I could make gingerbread pigs, gingerbread cats, gingerbread trees and the like but no gingerbread men or women. Did that reveal a subconscious disdain for humankind? Or a subconscious disdain for animals because I wanted to eat shapes of them!?! Then I decided it didn't matter because I was late and missing the party and, more importantly, the cookies! Once I was finished with decorating, I encountered a dilemma: with the icing still very wet (it's a delicious buttercream, after all, and I wasn't sure if it would harden), I couldn't very well stack them in a tin. So I had to bring them to the party on cookie sheets and platters. Luckily, the party was only 3 blocks away, so we walked them over and had to swerve around strangers exclaiming, "Mmm. Cookies!" The doorman at the Walsh's building gave us a curious glance, but it was NYC--he'd seen stranger things. Finally, we made it into their apartment and the warm embrace of fellow vegans, holiday decorations and holiday smells. 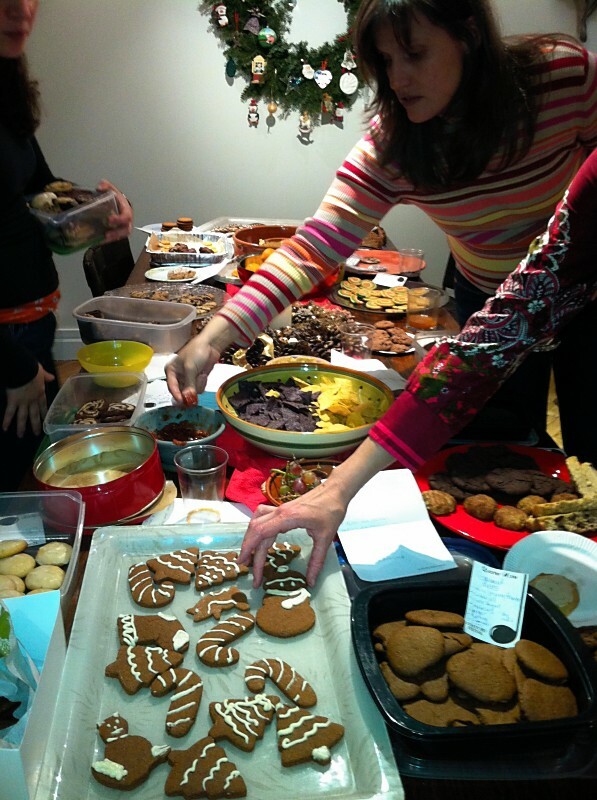 The cookies were met with smiles and placed on the dining room table alongside some of the most creative and delicious homemade confections I had tasted--by far the best cookie selection in the history of the Walsh family vegan cookie party. I finally had a chance to try one of my cookies, and it was nice: soft, chewy, not too sweet, with a hint of spice and marvelously molasses-y. With molasses being chock full of iron and calcium, I concluded that those nutrients balance out the sugar and white flour...right!?! Okay, so a vegan cookie party may not be entirely guilt-free, but serving up beautiful, festive, delicious treats that required no animals to be harmed in the process--well, that's certainly something you can feel good about, especially during a season that celebrates life, love, peace, and goodwill toward all. Happy holidays and happy cookie days! Marisa Miller Wolfson has organized more than 60 grassroots workshops and screenings of award-winning animal and environmental protection documentaries all over North America and decided to make “the film that was missing,” Vegucated, which follows the story of three New Yorkers who, for six weeks, adopt a vegan diet and a whole new way of thinking about food. When she isn’t preparing for the 2011 release of her documentary, she stays busy vegucating more than 1,000 veg-curious mentees through her free Vegan at Heart coaching program. She is Vice President of the Sustainable Leadership Council of New York City and the honored recipient of Farm Sanctuary's Farm Animal Friend Award.